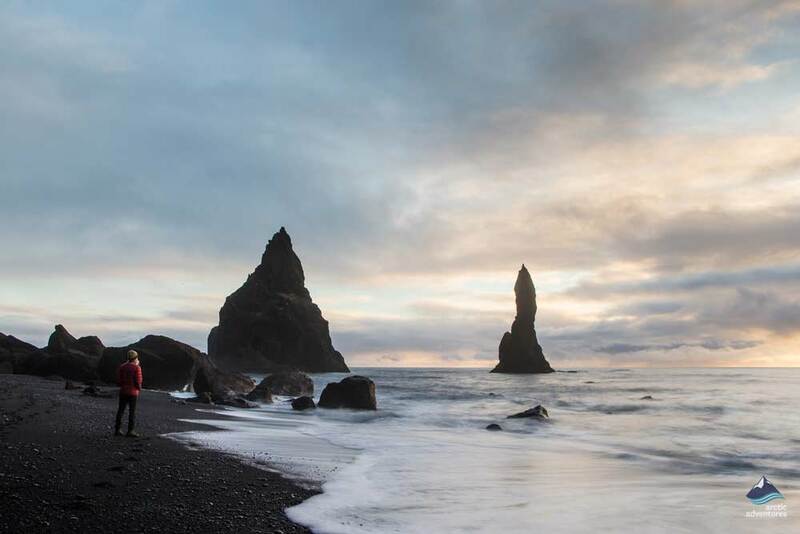 The South Coast of Iceland combines stunning natural landscapes with endless activities and attractions to enjoy. Apart from Reykjavik, the South is sparsely populated. Untouched beaches, glaciers, waterfalls, and small fishing villages make up most of the highlights of the coastline. Traveling along Iceland’s South Coast is an unforgettable experience. It offers verdant moss-covered lava fields, hidden waterfalls of all sizes, and countless off-the-beaten-track trails. With such a vast selection of attractions and activities to choose from, you might find yourself a bit lost when planning your trip. We have crafted this guide of attractions in the South of Iceland to help you choose what to do and where to go on your trip. Blue Lagoon is a geothermal spa located in Reykjanes. It is one of the most prominent attractions in Iceland famed for its healing capabilities and azure hot spring water. The cerulean water of the spa is charged with silica, sulfur, and algae and draws the attention of travelers from all over the world. These minerals improve overall skin condition and are known to heal psoriasis. The temperature of the water feels delightful against your skin as it averages perfectly between 99–102 °F (37–39 °C). Before the lagoon was turned into a spa, it was wastewater from the Svartsengi Geothermal Plant. In 1981, an employee of Svartsengi, Valur Margeirsson, decided to go for a dip in the wastewater despite ridicule and warnings from his fellow villagers. Not long after, the healing capabilities of the mineral-rich water were discovered and others joined Valur in the pool. In 1992, the Blue Lagoon was officially opened to the public. The hot spring is both man-made and crafted by Mother Nature. 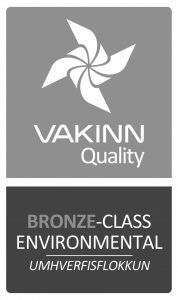 The water in the lagoon comes from the depths of the earth with a little help of Svartsengi Geothermal Plant and is replenished every two days. 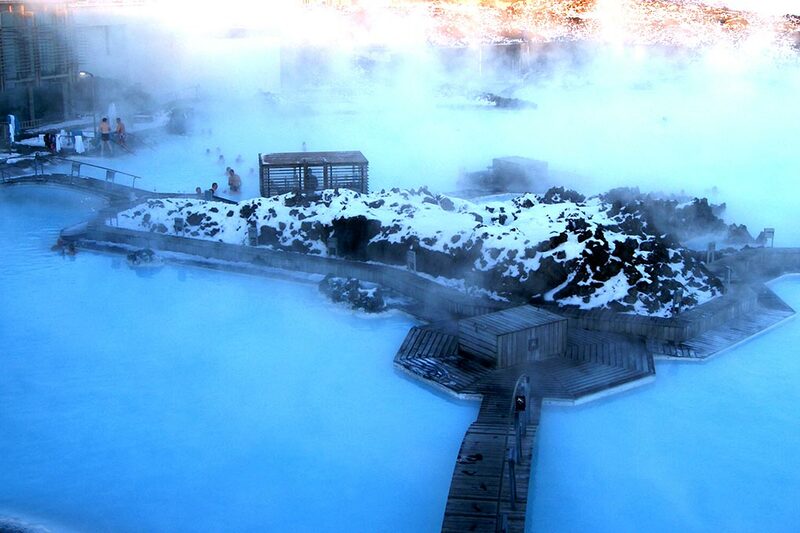 Take note, the Blue Lagoon in Iceland has a few quirky rules for everyone who uses it! One of which is that you’ll be asked to shower naked before entering the sky-blue waters. Silfra Fissure in Iceland is an underwater crevice between the two tectonic plates that meet under Thingvellir National Park. It was formed in 1789, after a number of underwater earthquakes opened a rift between the continental plates and flooded it with crystal clear water. 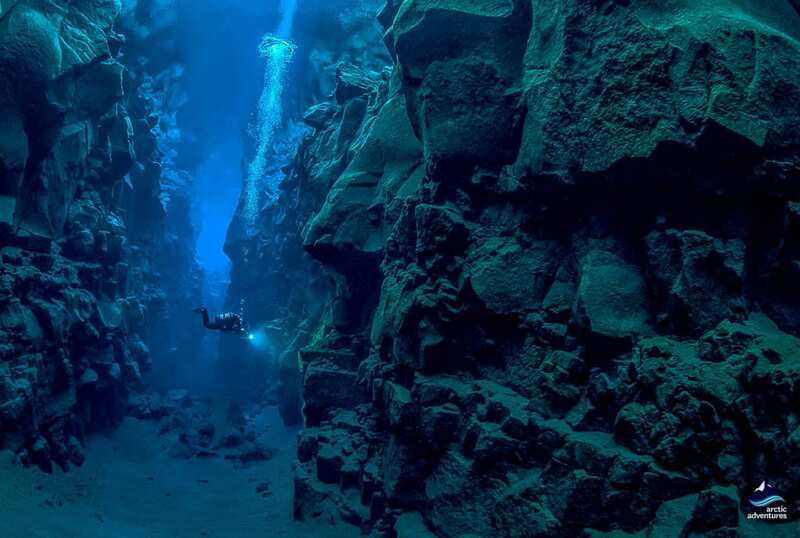 Water in Silfra is some of the clearest in the world, with visibility of about 328 feet (100 meters). It originates in the Langjokull Glacier and flows through the porous lava rocks of the tectonic plates for 30 to 100 years before reaching the rift. Silfra Fissure is also home to a variety of sea vegetation, such as verdant algae and various species of fish like trout, all of which makes it a bucket-list-worthy destination. Jokulsarlon Glacier Lagoon is an ever-changing natural wonder that was created in the1920s. It’s located in southeast Iceland, on the edge of Vatnajökull National Park. The lagoon is filled with meltwater from Breiðamerkurjökull Glacier, a tongue of the largest glacier in Europe, Vatnajokull. It’s famous for the icebergs that break away from the glacier and drift out to the sea, creating an apocalyptic landscape. Minutes away from the lagoon, lies the Diamond Beach, where dazzling icebergs rest glistening on the black sand. Plenty of photo opportunities await you there. The lagoon is home to a wide variety of wildlife. In addition to herring and capelin, it is also a nesting site for arctic terns as well as the great skuas. These birds are very protective of their eggs when breeding and should be admired from a safe distance. You may also spot seals lazing on the beach or the icebergs. Jokulsarlon Glacier Lagoon has appeared in a few Hollywood movies: The James Bond film A View To Kill, Lara Croft: Tomb Raider, and Batman Begins. Diamond Beach is located right next to Jokulsarlon. The strip of sequined black sand spreads out for about 11 miles (18 kilometers) and is covered in shimmering lily-white and cerulean blue icebergs slowly melting away into the Atlantic Ocean. Lethargic ice caps, sunbathing on the shore, a wide variety of wildlife, and the breathtaking surrounding landscape have made Diamond Beach one of the most famous black sand beaches in the world. The Diamond Beach in Iceland is also a nesting ground for birds such as the arctic tern or the great skua. The birds have made it popular with both nature lovers and wildlife enthusiasts. On the beach, you’ll also find a few seals, comfortably resting in peace. It’s worth noting that during the mating period, birds and the other wildlife can be very protective of their personal space. So if you want to take a few pictures, do so with caution. To get to the Diamond Beach is pretty easy and you can do so by joining our South coast day tour for example, or simply driving there yourself by car. The beach is located in the Southeast of Iceland, about 5-hours’ drive from Reykjavik. While it is a destination on its own, it’s also a part of Vatnajokull National Park and there’s a lot more you can do and see in the region. We recommend staying overnight to enjoy both the beach and the surrounding area. The Secret Lagoon in Iceland is a natural hot spring. Located in a geothermally active area close to the small town of Fludir, it’s the oldest public pool in Iceland. The lagoon is a part of the Golden Circle route and is widely visited by both tourists and locals alike. While similar to the Blue Lagoon, it’s cheaper and more rural, situated in the middle of a moss-covered lava field. The Secret Lagoon is accessible all year long and the temperature of the water is constant at 100° Fahrenheit (38-40° Celsius). Apart from perfectly warm water, the lagoon has other attractions to offer nearby. Geothermal hot spots and a small geyser surprising visitors every 4 minutes are there to entertain. The pool is surrounded by wooden pathways, which together with the steam rising from the pool create a mystical, picture-worthy scene. The Secret Lagoon in Iceland is as enjoyable in the winter as it is in the summer. 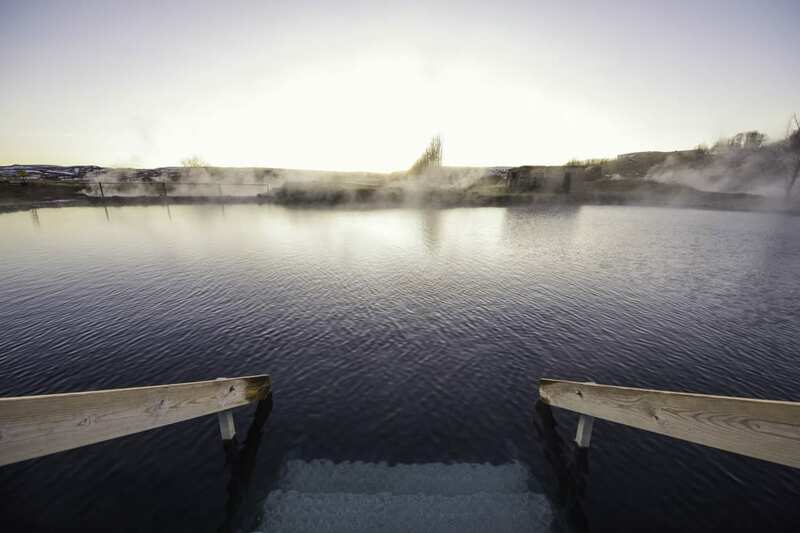 It’s a sublime experience to bathe in hot, geothermal water in the crisp winter air. If you’re really lucky, then the flickering colors of the Northern Lights may dance across the night sky during your visit – an unforgettable experience that you’ll treasure forever. Skogafoss is one of the largest waterfalls in Iceland, dropping about 197 feet (60 meters) and stretching across 82 feet (25 meters). The waterfall is located 92 miles (149 kilometers) from Reykjavik and it’s easy to spot if driving on the Ring Road. There’s a hiking path to the east of the waterfall, leading to the picturesque Fimmvorduhals Trail, which then continues onto the famous Laugavegur Trail. Due to the amount of mist the waterfall produces, on a sunny day, one or even a few rainbows often form, creating a whimsical background for pictures. The water cascades down on a flat pebbled base, making the approach up to the waterfall easy yet damp. Make sure you have waterproof clothing if you want to get close to it. The waterfall can also be admired from above. There’s a narrow, moss-covered staircase leading all the way up to the top of the waterfall where you’ll feel like you’re standing on top of a rainbow. Breathtaking views of southern Iceland open up, showcasing the rural landscape sitting quietly under moody Scandinavian skies. Perhaps you might even spot a chest of treasure hidden under the falls by the first Viking settler Thrasi Thorolfsson. Fimmvorduhals is a trail between the Eyjafjallajökull and Mýrdalsjökull glaciers. 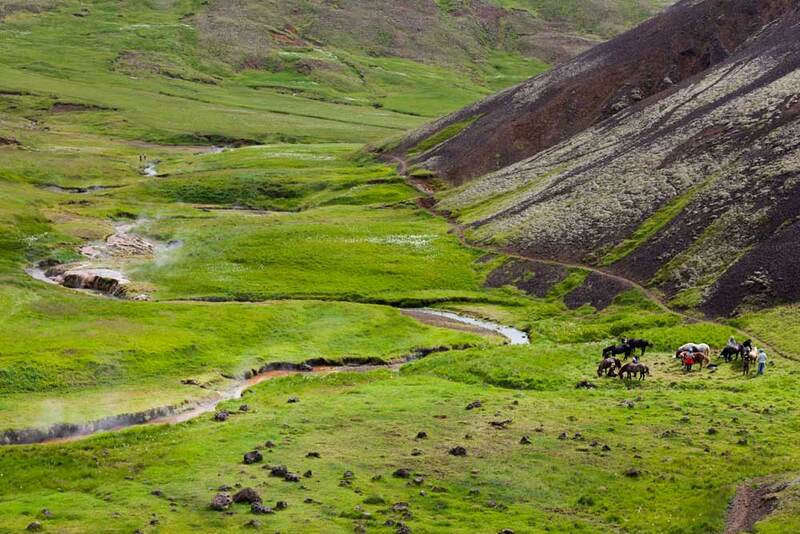 It stretches out through the diverse terrain for around 15 miles (25 kilometers), connecting Skogar with the Thorsmork Valley and can only be accessed during summer. The weather on the trail is very unpredictable and anything from summer rain to severe hails is possible. The trail is devoured by local hikers and is a site of pilgrimage for adventure seekers from around the world. While it is possible to complete the trail in a day, we recommend to take your time and really soak in the breathtaking scenery. There are two mountain huts on the way to the Thorsmork Valley, where you can stay overnight if you want to spend more than one day in the area. While the trail is only 15 miles (25 kilometers), it’s not recommended for absolute beginners. To get the most out of it you should be in relatively good physical condition. Hekla is the most active volcano in Iceland and has erupted over 20 times since 874 c.e., with another eruption expected soon. Nonetheless, scientists suggest that the volcano is perfectly safe to explore for now. During the Middle Ages, Icelanders called it the Gateway to Hell, though it’s now often referred to as the Queen of Iceland. The last eruption took place from February 26 to March 8, 2000. The volcano looks a lot like an overturned boat, with active craters stretching over both sides. At one time, it was covered by birch and willow trees. Due to human interference and volcanic eruptions, the soil around the volcano has transformed into a vast, moss-covered lava field. Hiking is very popular in the area around the volcano. While you’re able to hike to the summit of the volcano on your own, it’s strongly recommended that you go in the company of an experienced mountaineering guide. Hekla Volcano is rather unpredictable, so the information that our qualified guides are able to provide will make the adventure safe and insightful. Reykjadalur, also known as the Valley of Steam, is located near the small town of Hveragerdi, which is a 45-minute drive from Reykjavik. The picturesque geothermal valley with its steamy river is a popular destination among hikers and those ticking hot spring pools off of their bucket list. A geothermally heated river, cooled slightly by glacial meltwater, runs through the valley making it ideal for bathing. If you hike there on a hot summer day, you might be surprised by the number of locals and tourists soaking in the mineral-rich water. The approach to the valley is fairly easy. You can reach it by driving along the Ring Road from Hveragerdi to the South. Once there, leave your car at the parking lot and begin a hike into the hills. A handful of bubbling hot springs will guide your way towards the river at the top of the valley. Reynisfjara Beach is a world-famous black sand beach, located right next to a small town called Vik. Visitors will see phantasmagoric landscapes meet the rampant waves of the Atlantic Ocean. Reynisfjara is considered to be one of the most beautiful beaches in the world and should be high up on everyone’s bucket list. The high and mighty basalt columns towering over the beach, achromatic grains of sand, and restless sea stacks visible just off the shore are what gives you perspective. You suddenly realize how little you are compared to nature. Reynisfjara is easy to reach. It’s a two-hour drive from Reykjavik and it won’t take you more than half a day to explore the beach. In the surrounding area, there’s plenty of other sights to enjoy for a full day or two, including waterfalls, a small fishing village, a glacier, and even an ice cave. Seljalandsfoss is one of the most famous waterfalls in Iceland. It’s visible from the Ring Road and is easy to approach on foot. A short walk from the parking lot will take you up close to the waterfall, where you’ll feel the untamed power of nature. Continue until you’re fully behind the curtain of the waterfall and you’ll find yourself in the backstage of the incredible water show where breathtaking photo opportunities await. The waterfall drops for 197 feet (60 meters) down from a crest that used to mark the country’s southern coastline. 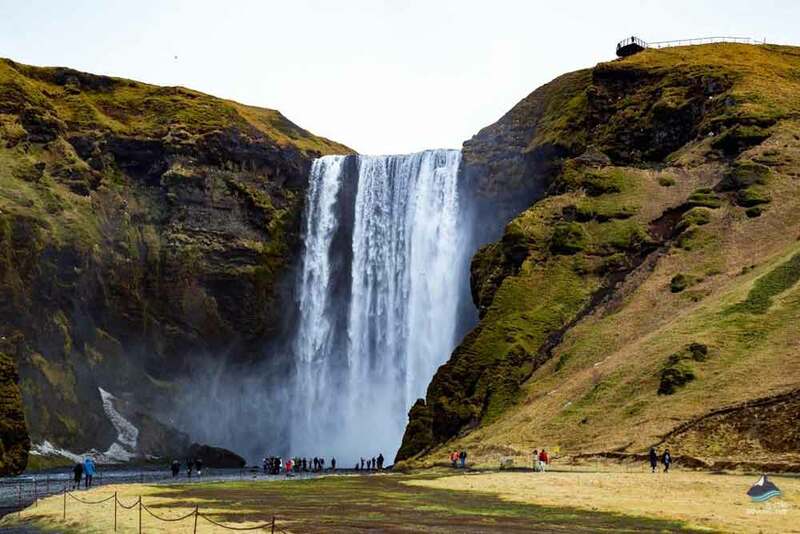 It’s close to several other attractions, including Skogafoss Waterfall, which is equally as enchanting, and, according to a local legend hides a treasure chest beneath its pool. In the southeast of Iceland, Fjadrargljufur Canyon stretches out for about 1.2 miles (2 kilometers) and 330 feet (100 meters) into the ground. At the bottom, glacier-fed Fjadra River carves out its rugged, steep walls. 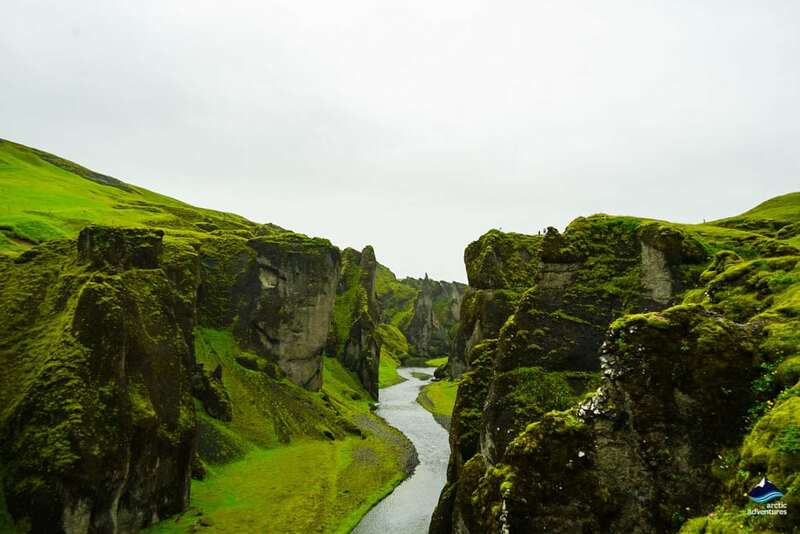 Fjadrargljufur Canyon is located close to the Ring Road and yet is largely unknown. To get to it, you need to drive east towards Hofn and exit the road near Kirkjubæjarklaustur Village. Then take the mountain road no. F206 and ride for a few more minutes until you reach the parking area. There are two ways you can hike the canyon: you can take a path at the top that goes along the rim of the ravine, or if you prefer a more extreme hike, walk down to the bottom of the canyon. Regardless of the path you choose, you’ll be rewarded with enchanting views of moss-covered rough stone and rapidly flowing river. Please note hiking along the bottom of the canyon might require you to wade the river at some points. Also, if you hike from east to west, expect to be surprised by the playful waterfall, cascading down the gorge. Vík í Mýrdal is the southernmost town in Iceland. Due to adverse weather conditions, the village is the only town on the island without a harbor. It’s also the warmest and wettest municipality in the country. Although it only has a little over 300 inhabitants, the town is a popular destination for many tourists and locals. It’s a great place to recharge on your way across the south, refuel your car or even sleep over in between sightseeing. Vik and the surrounding area are home to a myriad of natural wonders. Just outside of the village lies a breeding ground for arctic terns and, to the southwest of Vik, the Dyrhólaey Peninsula is home to adorable puffins and eider ducks. 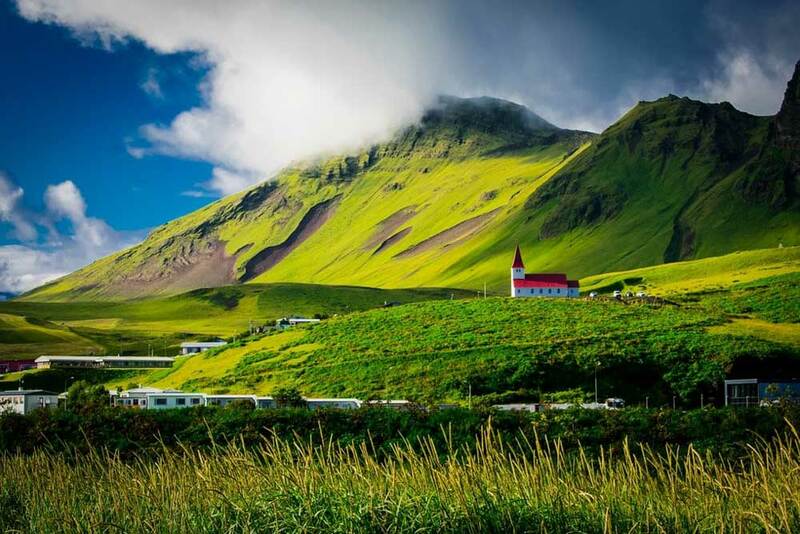 North of Vik, you’ll find Mýrdalsjökull Glacier covering the upper part of the Katla Volcano, and to the South lies world-famous Reynisfjara Beach. The town is certainly a wonderland to all nature and wildlife lovers. The Ring Road, otherwise known as Route 1, is the main road in Iceland, encircling the entire island and connecting all the main cities and towns. The road is 828 miles (1,332 kilometers) long and is paved with asphalt for the most part. However, when driving along the east coast, you might encounter some narrow gravel mountain roads. The road is in good condition, though if traveling in winter or intending to go off the road, it is strongly recommended to do so in a 4WD vehicle. The Ring Road is perfect for people who want to tailor their own itinerary. We have an abundance of self-drive tours, where you simply rent a car and explore the country your way. Most of the attractions in the South of Iceland can be found on the Ring Road or not far from it. 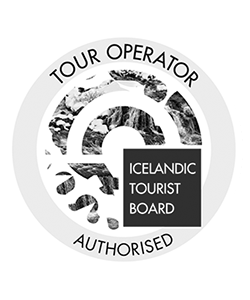 We recommend that you start with the Golden Circle tour. It’s famous for Gullfoss, one of the most visited waterfalls in Iceland, and Geysir, a hot spring area that gave the word geyser to the English language. 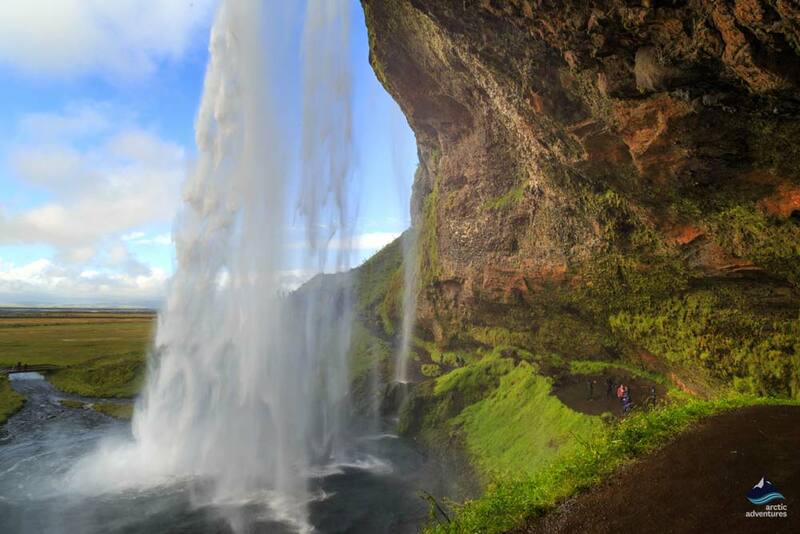 Next, you can continue towards the east of the country hitting such landmarks as the Seljalandsfoss and Skogafoss waterfalls, Vik, Reynisfjara Beach, and many more. If you’re looking for an abundance of diverse landscapes in a single range, Skaftafell National Park is the place to go. 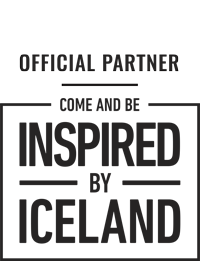 The park was established in 1967, as a single entity. In 2008, it became a part of the neighboring Vatnajokull National Park. Together with Vatnajokull, Skaftafell National Park is around 8,699 square miles (14,000 square kilometers) in size, embracing every single type of terrain you could imagine. Apocalyptic highlands covered in dark volcanic sand, sleeping volcanoes that are due to erupt, rivers and lagoons mirroring the mountains capped with luminous lily-white snow – all make Skaftafell National Park an absolute must during your time in the South of Iceland. While there are no roads inside the park, it is crisscrossed by hiking trails for you to explore. It’s possible to hike alone, however, we recommend that you go on a tour with a knowledgeable guide. They will tell you little-known facts about the park, its history, the formation of it and the surrounding areas. Solheimajokull is a glacier between the Katla and Eyjafjallajokull volcanoes. It’s approximately 5 miles (8 kilometers) long and 1.2 miles (2 kilometers) wide and is part of the larger Myrdalsjokull Glacier, which lies just on top of the caldera of the Katla Volcano. Solheimajokull is easy to access and surrounded by breathtaking, snow-capped mountains making it popular with locals and tourists. We recommend that you hike to the top of the glacier. There you will be rewarded with breathtaking views of the South Coast and outstanding photo opportunities. If you intend to explore Solheimajokull, we highly recommend that you book a guided tour. 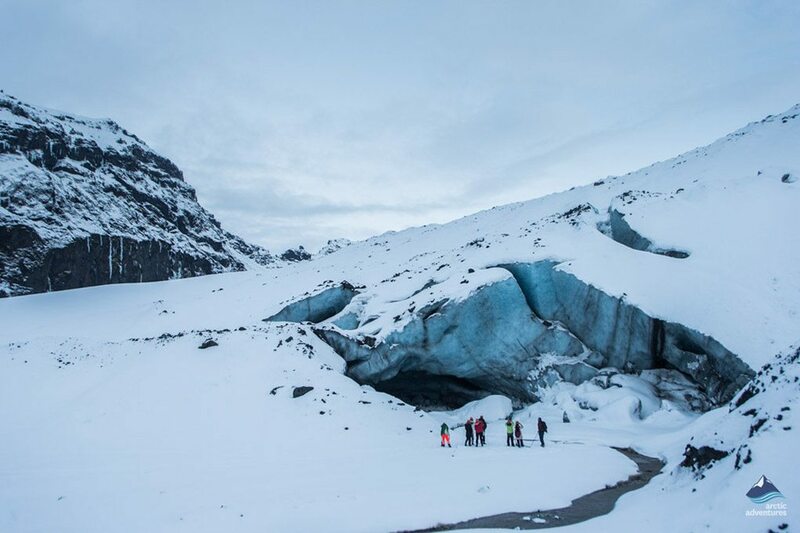 With a tour guide, you’ll be able to safely traverse across the top of the glacier, try out ice climbing, and explore the existing ice caves. 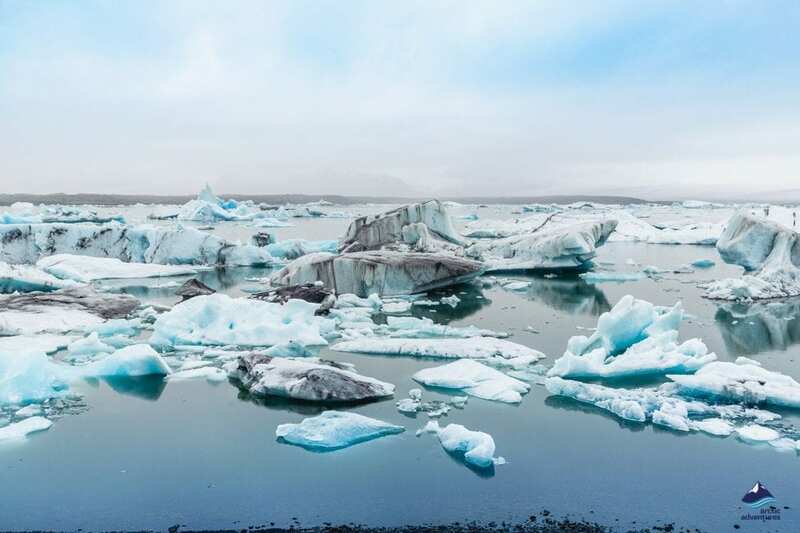 Just like most of the glaciers in Iceland, Solheimajokull is rapidly melting away and experts have warned that it may no longer be accessible even a decade from now. Vatnajokull National Park is one of three national parks in Iceland. 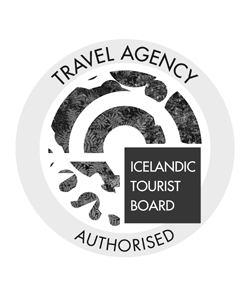 It contains the Vatnajokull Glacier, Skaftafell Nature Reserve, and Jokulsarlon Glacier Lagoon. Each of the components of the national park is an attraction in itself. The unique landscape of it was created by river erosion, glacial movements, and volcanic eruptions. Vatnajokull Glacier takes up the majority of the national park and is the largest glacier in Europe. 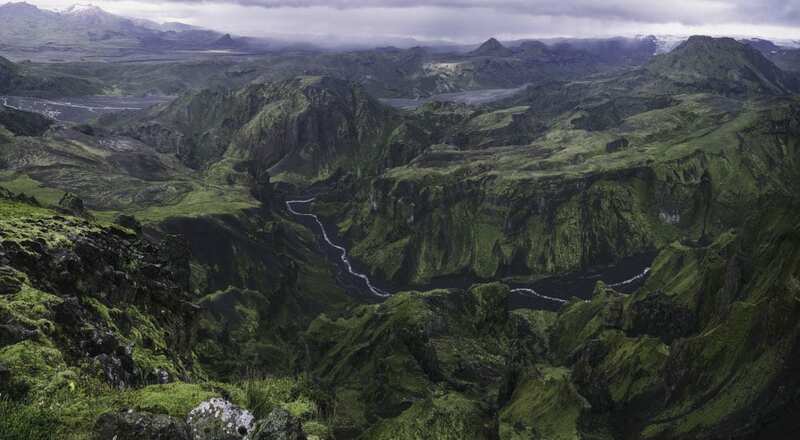 It covers approximately 9% of Iceland and hides several volcanoes underneath. Scientists have declared that the volcanic eruptions are long overdue. Nevertheless, they do monitor the area carefully and have determined that, for now, it’s still a safe place to hike. According to the Guinness World Records, the Vatnajokull Glacier has the longest sight line in the world, allowing you to see for a whopping 340 miles (550 kilometers). If you haven’t put the Vatnajokull National Park and Glacier on your bucket list yet, then you should soon! 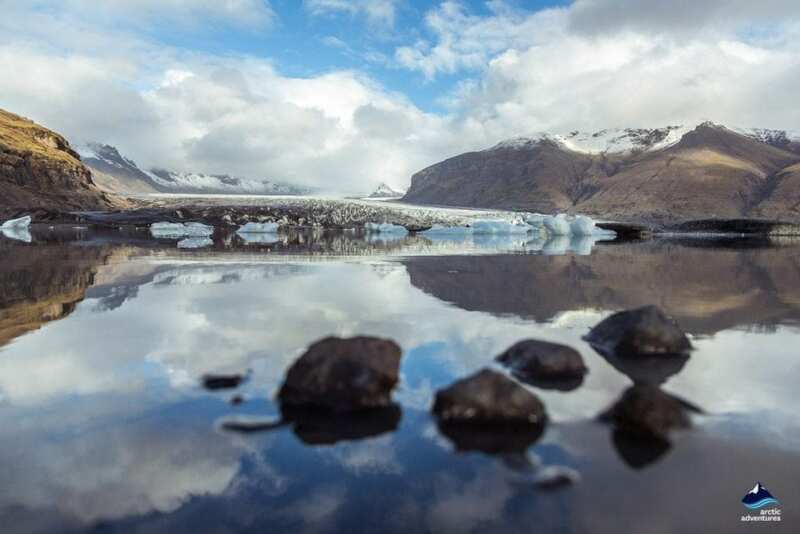 Climate change is already affecting Iceland’s natural treasures, and melting icebergs are causing the land surface to rise as much as 1.4 inches annually. 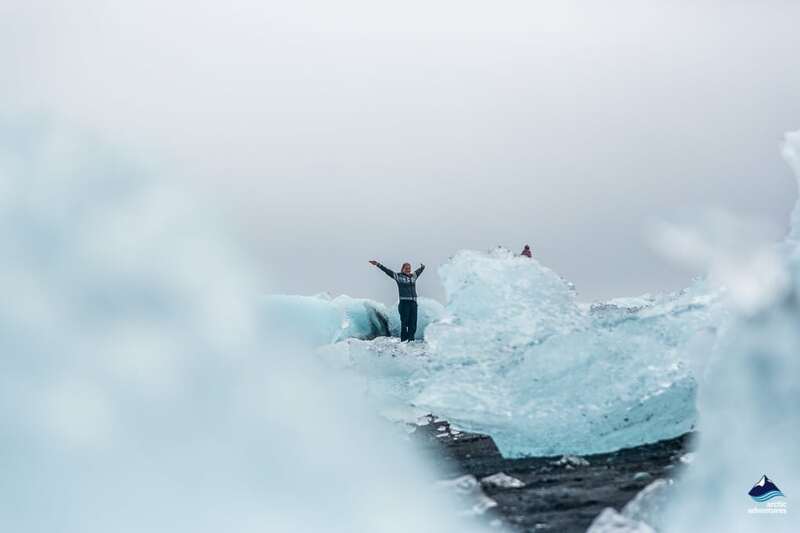 Vatnajokull offers hiking tours, a chance to explore ice caves, and the opportunity to cruise on one of the lagoons that wash the shore of it. Eyjafjallajokull is one of the very few stratovolcanoes in Iceland. A stratovolcano is described as a volcano whose caldera is hidden under a glacier. Usually, eruptions of this type of volcanoes are very dangerous, as the world witnessed firsthand with this one’s eruption in 2010. The explosion disrupted European air travel for a couple of weeks, stranding hundreds of airplanes and passengers. 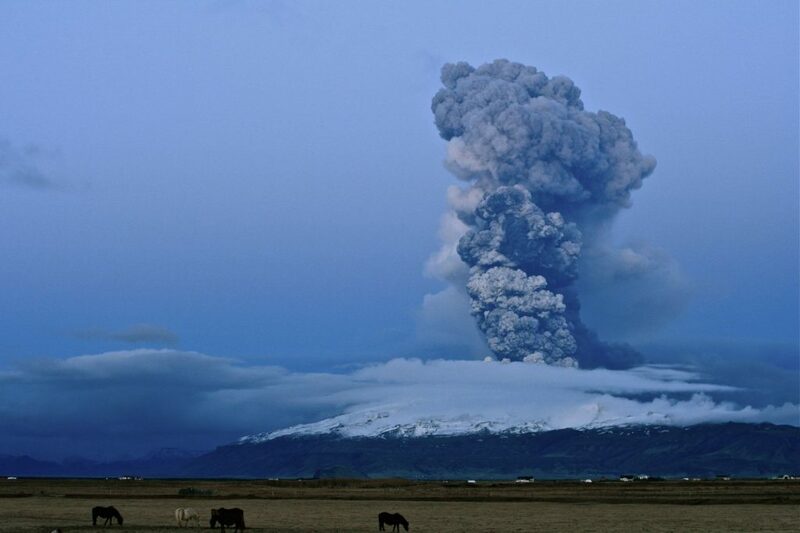 Neighboring towns in Iceland were evacuated due to lava ash floods. Thanks to its notoriety, Eyjafjallajokull Volcano is still one of the most visited volcanoes in Iceland, and is perfectly safe these days, hosting hundreds of tours to its peak and ice cave. There are a few ways you can explore the volcano. 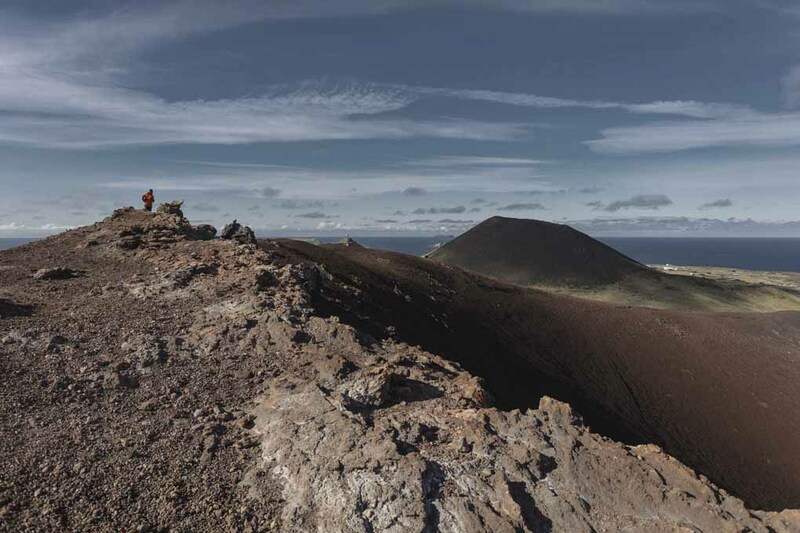 The most popular way is the Fimmvörðuháls Trail, a circular hike around the volcano. The trail takes around a day to hike and is considered to be fairly easy. The second way to explore the volcano is to traverse the surrounding glacier. After the eruption, the glacier shrunk significantly and became less popular. However, it remains an astounding place of glorious natural beauty. The hike to the glacier is very difficult and should only be attempted with an experienced guide. You can also try riding on a glacier with a snowmobile on one of our tours. Vestmannaeyjar is an archipelago of around 30 islands south of the mainland. It has around four thousand inhabitants and became world-famous after a volcanic eruption in 1974. During the eruption, in an attempt to tame the hot-like-hell lava, locals pumped seawater directly onto the lava. The waters helped to cool and redirect the flow, and to save the lives and homes of 5,300 people. As a result, the island is now a popular tourist attraction, with an extended harbor and a runway for planes. Vestmannaeyjar is also widely visited for its natural beauty and the many adorable puffins who consider the island their home. Over ten millions of puffins come to Iceland to breed each year and most of them choose Vestmannaeyjar.